Distinct Notch ligands possess a characteristic ability in terms of functional T cell differentiation. However, the precise role or the therapeutic potential of each Notch ligand in autoimmune diseases is largely unknown. In this study, we examined whether Jagged1 modulates a collagen-induced rheumatoid arthritis (CIA) model by altering T cell responses. 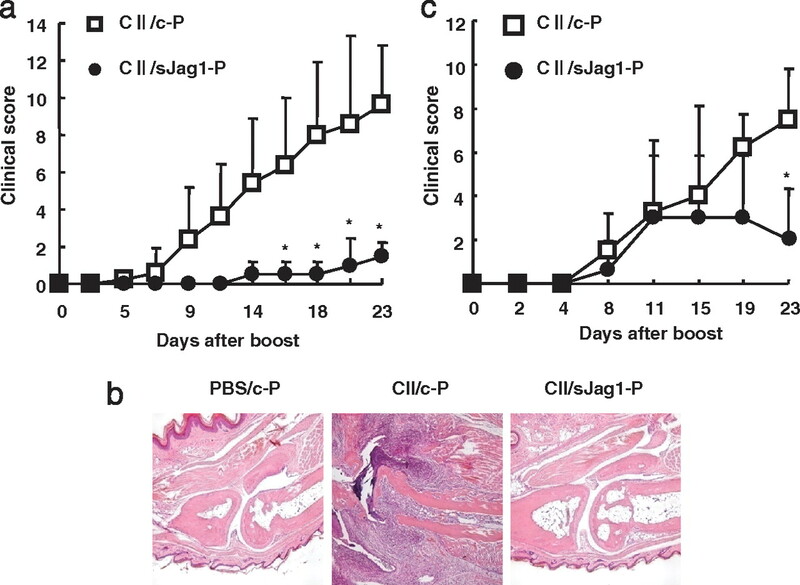 The injection of a soluble Jagged1-encoding plasmid, sJag1-P, before or even after initial type II collagen (CII) immunization suppressed the disease severity of CIA. However, this treatment did not suppress CII-specific CD4+ T cell proliferation and CII-specific Ab production. Depletion of either CD4+ or CD8+ T cells ameliorated CIA severity and sJag1-P further improved CIA in CD4+ but not CD8+ T cell-depleted mice. Injection of OVA and Jagged1-encoding plasmids inhibited proliferation of OVA-specific granzyme B-producing CD8+ T cells, although Jagged1 could not directly inhibit CD8+ T cell proliferation in vitro. The blockade of Jagged1 by an anti-Jagged1 Ab exacerbated CIA, whereas this effect was not observed in the absence of CD8+ T cells. These data indicate that Jagged1 is able to deliver an indirect negative signal into CD8+ T cells in vivo, which suggests its therapeutic potential in the treatment of CD8+ T cell-mediated diseases, including rheumatoid arthritis. Notch is a transmembrane receptor that generally regulates cell fate or differentiation (1, 2). Several articles have demonstrated that Notch regulates the functional differentiation of mature CD4+ T cells (2, 3, 4, 5, 6, 7, 8). There are two Notch ligand families, Delta-like (DL)4 1, 3, and 4 and Jagged 1 and 2, and each ligand has distinct roles in CD4+ T cell activation (3, 7, 9, 10). One of the ligands, Jagged1, has CD4+ T cell suppressive ability (9, 10) and also controls type II Th cell (Th2) differentiation (7). As for the contribution of Notch signaling to CD8+ T cell activation, one article reported that overexpression of DL1 renders CD8+ T cells unresponsive (11), whereas another article demonstrated that blocking Notch signaling using a γ-secretase inhibitor suppressed CD8+ T cell responses (12). Furthermore, we have recently demonstrated that Notch2 signaling directly controls the expression of effector molecules in cytotoxic CD8+ T cells (13). Regarding the involvement of Notch signaling in autoimmune diseases, one report demonstrated that a γ-secretase inhibitor blocked Notch signaling, thereby suppressing the progression of experimental autoimmune encephalomyelitis (EAE) (6). Another report demonstrated that the administration of anti-Jagged1 mAbs exacerbated the clinical features of EAE, whereas administering anti-DL1 mAb reduced disease severity (14). Although these articles do not demonstrate which Notch and Notch ligands are interacting to regulate each phenotype, these data suggest that modulation of Notch signaling has an alternative beneficial way to treat autoimmune diseases. In this study, we investigated whether Jagged1 was able to suppress development of collagen-induced arthritis (CIA), where both cellular and humoral mechanisms are involved in the pathogenic process (15, 16). We found that injection of a soluble Jagged1-encoding plasmid (sJag1-P) in DBA/1J mice that were previously immunized with bovine collagen type II (CII) suppressed CIA progression. Treatment with sJag1-P inhibited CD8+ but not CD4+ T cell activation, which contributes to the suppression of CIA development. These results indicate that modulation of Jagged1 could provide a new strategy for treating T cell-mediated autoimmune diseases, including rheumatoid arthritis. Six- to 8-wk-old DBA/1J and C57BL/6 mice were purchased from Japan SLC and all mice were maintained under specific pathogen-free conditions in the animal research center of the University of Tokushima, Tokushima, Japan. All animal studies were approved by the animal research committee of the University of Tokushima. FITC-conjugated anti-CD4, allophycocyanin-conjugated anti-CD25, or FITC-conjugated anti-CD8 mAbs (eBioscience) and PE-conjugated H-2Kb OVA tetramer (MBL International) were used for cell staining. In some experiments, cells were fixed with 4% paraformaldehyde and stained with allophycocyanin-conjugated anti-granzyme B (Caltag Laboratories) or PE-conjugated anti-Foxp3 (eBioscience) mAbs in saponin-containing buffer. Fluorescence intensity of ∼105 cells was examined using a FACSCalibur cytometer (BD Biosciences). Five μg/ml bovine CII in PBS was coated on a 96-well plate overnight at 4°C. After washing with PBS plus 0.05% Tween 20 (PBST), serially diluted serum samples were applied to each well and incubated at room temperature for 1 h. Wells were washed with PBST, followed by the addition of alkaline phosphatase-conjugated goat anti-mouse IgG, IgG1, and IgG2a (Southern Biotechnology Associates). Alkaline phosphatase activity was measured using 4-nitrophenyl phosphate disodium salt hexahydrate (Sigma-Aldrich) as a substrate. To determine the titer of soluble Jagged1, 1 μg/ml anti-FLAG-specific mAb (Sigma-Aldrich) was coated on a plate and 1/10 diluted sera was added to the wells. Biotin-conjugated anti-Jagged1 Ab (Santa Cruz Biotechnology) followed by streptavidin-HRP (eBioscience) was then incubated. After the addition of tetramethylbenzidine (eBioscience), the absorbance of each well was measured at 415 nm. To detect IL-17, IL-4, and IFN- γ in cell culture supernatants, we used the mouse IFN-γ, IL-10 (Endogen), or IL-17 ELISA kit (R&D Systems). Male DBA/1J mice were injected intradermally at the base of the tail with 200 μg of bovine CII (Collagen Research Center, Tokyo, Japan) emulsified in 100 μl of CFA (Difco). This was followed by a booster injection at 3 wk after the primary immunization. Mice were monitored for signs of arthritis by clinical scoring and by measuring the width of the forelimbs at each of the time points indicated. For assessment of disease severity, the following clinical scoring scale was used: 0, no evidence of erythema or swelling; 1, erythema and mild swelling confined to the midfoot or ankle joint; 2, erythema and mild swelling extending to the ankle and the midfoot; 3, erythema and moderate swelling extending from the ankle to the metatarsal joints; and 4, erythema and severe swelling encompassing the ankle, foot, and digits. Total disease severity scores were recorded as the sum of clinical scores for all four limbs. A 3× FLAG tag was fused to the C terminus of the full-length mouse Jagged1 gene or to the extracellular domain (aa 1–1607), and cloned into pcDNA3.1. The OVA gene (provided from Dr. T. Sakai, University of Tokushima) was also cloned into pcDNA3.1. Fifty μg of DNA in PBS was injected into the gastrocnemius muscle after bupibacaine treatment. The injection schedule for CIA was as follows: days −23, −15, and −7 or days −14 and −7, where the day of the second CII immunization was designated as day 0. As for the Ab treatment experiments, purified anti-CD4 (GK1.5) mAb, anti-CD8 (53-6.7) mAb (150 μg) or anti-Jagged1 mAb (100 μg) (14) was injected into mice every other day starting on the day of the second CII booster injection. 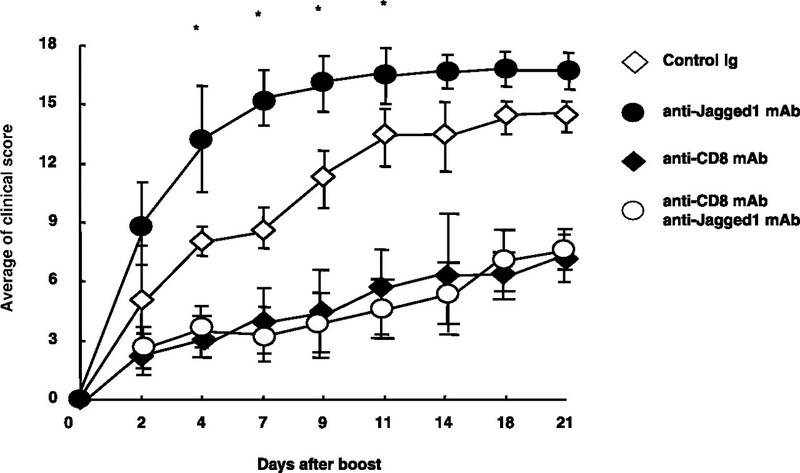 In some experiments, both OVA and full-length Jagged1-encoding plasmids (each 100 μg) were injected once every 7 days (days 0, 7, and 14) into the gastrocnemius muscle two days after bupibacaine treatment. CD4+ or CD8+ T cells were purified from total spleen or lymph node cells by incubating cells with anti-CD4 mAb (GK1.5) or anti-CD8 mAb (53-6.72), followed by positive selection of CD4+ or CD8+ cells with anti-rat IgG micro beads (Miltenyi Biotec). Full-length cDNA of mouse Jagged1 was cloned into the pKE004 retroviral vector (3) and the retrovirus was constructed by transfecting vectors into Plat-E cells as previously reported (17, 18). DCEK cells (19) were infected with retrovirus one time and GFP+ cells were sorted by cell sorting. Purified CD8+ T cells from C57BL/6 mice were incubated with 5 μM CFSE (Molecular Probes) for 10 min at 37°C. After three washes, labeled cells were incubated with DCEK cells for three days and the dilution of CFSE was measured by flow cytometry. CD4+ T cells purified from DBA/1J mice 7 days after CIA induction were stimulated with CII protein (30 μg/ml) in the presence of irradiated spleen cells from DBA/1J mice for 3 days. Proliferation was measured in triplicate by incorporation of [3H]thymidine (1 μCi/well; PerkinElmer Life Sciences) during the last 8 h of culture. RNA was isolated from T cells by TRIzol (Invitrogen) and cDNA was generated using Omniscript reverse transcription (Qiagen) according to the manufacturer’s instructions. mRNA expression levels were quantified using the ABI 7500 real-time PCR System (Applied Biosystems). cDNAs were amplified with TaqMan probes using SYBR Premix Ex Taq (Takara). mRNA expression levels were normalized relative to GAPDH gene expression levels. Fold differences in mRNA levels were determined using SDS system software version 1.4.0 (Applied Biosystems). Primer sequences are as follows: GAPDH, 5′-TCCACCACCCTGTTGCTGTA-3′ (forward primer) and 5′-ACCACAGTCCATGCCATCAC-3′ (reverse primer); Deltex1, 5′-CACTGGCCCTGTCCACCCAGCCTTGGCAGG-3′ (forward primer) and 5′- CTCATAGCCAGATGCTGTGACCAG-3′ (reverse primer). 293T cells were transfected with soluble Jagged1-encoding pcDNA3.1 using FuGENE6 transfection reagents (Roche Diagnostics), and cell supernatants were collected 3 days after transfection. Jurkat cells were transfected with TP-1 reporter genes using FuGENE6 transfection reagents (Roche Diagnostics) in the presence or absence of soluble Jagged1-containing supernatant (dilution 1/10). Twenty-four hours after transfection, luciferase activity was measured by the Dual luciferase assay system (Promega) according to the manufacturer’s protocol. Firefly luciferase activity was normalized to the Renilla luciferase activity of pRL-TK. All values were obtained from experiments conducted in triplicate and repeated at least four times. Paws and knee joints were fixed in 10% formalin, decalcified by 10% EDTA in PBS for 14 days, embedded in paraffin, and sectioned. Tissue sections from knee joints were stained with H&E. The Mann-Whitney U test was used to analyze the clinical scores. The unpaired t test was used to analyze the other results. Values of p < 0.05 were considered to be significant. To investigate whether Jagged1 prevents CIA, we first examined whether overproduction of Jagged1 in vivo using a soluble Jagged1-encoding plasmid has preventive effects for CIA. Soluble mouse Jagged1 (aa 1–1607) was cloned into pcDNA3.1 (sJag1-P) and injected into the gastrocnemius muscle 1 day before and 7 and 14 days after the first immunization of bovine CII. After the second immunization of CII (designated as day 0), clinical scores were compared in sJag1-P and control plasmid (c-P)-treated mice (Fig. 1⇓a). The c-P-treated mice began to show clinical arthritic symptoms 5 days after the second immunization (Fig. 1⇓a). CIA symptoms in sJag1-P-treated mice were delayed ∼9–10 days compared with c-P mice. Overall clinical scores were lower in sJag1-P than in c-P-treated mice (Fig. 1⇓a). Histological analysis revealed little infiltration of cells or bone erosion in sJag1-P-treated mice compared with marked cell infiltration and bone erosion in control mice (Fig. 1⇓b). Jagged1 DNA vaccination prevents development of CIA. a, DBA/1J mice immunized by CII received sJag1-P (•) or c-P (□). The plasmid was injected 2 days before and 6 or 14 days after the first CII immunization. After the second CII immunization (day 0), CIA clinical scores were monitored. Results are shown as mean ± SE. The asterisk (∗) indicates statistically significant differences (p < 0.01). Five to seven mice per group were used for each experiment and the results are representative of four independent experiments. b, Histological evaluation was conducted 25 days after the second CII immunization. At this time, joint samples were stained with H & E. Data are shown in mice immunized by PBS and c-P (PBS/c-P), CII, and c-P (CII/c-P), or CII and sJag1-P (CII/sJag1-P). The results are representative of four independent experiments. c, DBA/1J mice that were immunized by CII received sJag1-P (•) or c-P (□). Plasmids were injected 7 and 14 days after the first CII immunization. After the second CII immunization (day 0), clinical scores of CIA were evaluated. Results are shown as mean ± SE. The asterisk (∗) indicates statistically significant differences (p < 0.05). Five to seven mice per group were used for each experiment, and these results are representative of three independent experiments. We next tested whether Jag1-DNA injection had a therapeutic effect on CIA by starting sJag1-P treatment 7 and 14 days after the first CII immunization (Fig. 1⇑c). sJag1-P treatment, even after the initial CII immunization, significantly suppressed clinical CIA scores compared with c-P-treated mice (Fig. 1⇑c), suggesting that Jagged1 also has a therapeutic effect on CIA. We could not see any therapeutic effect when sJag1-P was injected after the second CII immunization (data not shown). Several papers demonstrated that soluble Jagged1 has an inhibitory activity for Notch and Notch ligand interactions (20, 21). Therefore, we investigated whether soluble Jagged1 generated by our method had stimulatory activity for the Notch receptor. We first tested whether Jagged1 protein is really present in sera after sJag1-P injection. Jagged1 protein was found in sera from Jag1-P-treated mice that received CII and in controls that did not receive CII (Fig. 2⇓a). The level of Jagged1 protein was relatively higher in CII-immunized mice than in nonimmunized mice (Fig. 2⇓a), suggesting that CII-induced inflammatory responses help generate Jagged1 protein in vivo. We next tested whether soluble Jagged1 could stimulate Notch using a reporter gene assay. 293T cells were transfected with sJag1-P and supernatants were collected after 72 h in culture. Jurkat cells transfected with the TP1 reporter gene were stimulated with soluble Jagged1-containing medium for 24, 48, or 72 h. This augmented TP1 reporter activity 72 h after stimulation (Fig. 2⇓b), indicating that soluble Jagged1 was able to stimulate Notch receptors in vitro. We then examined the expression of a Notch target gene, Deltex1, in CD4+ or CD8+ T cells of sJag1-P and c-P-treated mice (Fig. 2⇓c). Immunization of OVA in mice up-regulated Deltex1 in both CD4+ and CD8+ T cells, and treatment with sJag1-P further up-regulated the expression in both types of cells (Fig. 2⇓c). Taken together, these data strongly suggest that soluble Jagged1 generated by our method stimulates Notch receptors but does not inhibit endogenous Notch signaling in our experimental system. Soluble Jagged1 stimulates Notch receptors. a, Jagged1 protein was measured in the serially diluted sera from mice immunized with CII and sJag1-P (filled bar) or PBS and sJag1-P (gray bar) (day 27). The titer of mice immunized by CII alone was used as control (open bar). Results are shown as mean ± SD; an asterisk (∗) indicates statistically significant differences (p < 0.05) against control. b, Soluble Jagged1 protein was produced by transfecting c-P or sJag1-P into 293T cells. Soluble Jagged1 protein-containing medium (filled bar) or control medium (open bar) was added to Jurkat cells previously transfected with TP-1 reporter genes. Luciferase activity was measured 24, 48, or 72 h after TP-1 transfection. Firefly luciferase activity (R1) was normalized to Renilla luciferase activity (R2) of pRL-TK. Results are representative of four independent experiments. Results are shown as mean ± SE. The asterisk (∗) indicates statistically significant differences (p < 0.05). c, The sJag1-P or c-P plasmid was injected two times into DBA1/J mice immunized by OVA, and CD4+ or CD8+ T cells from lymph nodes were isolated 2 days after plasmid injection. Expression of Delex1 mRNA in CD4+ (left) or CD8+ (right) T cells was measured by real-time PCR. The value obtained from Deltex1 expression in T cells from unimmunized mice was set as 1. Data are shown as the mean ± SE. The asterisk (∗) indicates statistical significance (p < 0.05). CD4+ T cell activation is involved in CIA progression (22). Therefore, to examine whether sJag1-P treatment affects CD4+ T cell proliferation, we stimulated CD8+-depleted spleen cells from sJag1-P or c-P-treated and CII immunized mice. CD4+ T cell activation was comparable between sJag1-P-treated mice and c-P-treated mice (Fig. 3⇓a), although previous reports demonstrated that Jagged1 was able to suppress CD4+ T cell proliferation (14). sJag1-P does not affect CD4+ T cell activation in vivo. a, DBA/1J mice were immunized by CII and treated with c-P (CII/c-P) or sJag1-P (CII/sJag1-P). Spleen cells were isolated 8 days after the second CII immunization and CD4+ T cells were stimulated with CII (30 μg/ml) in the presence of irradiated spleen cells for 3 days. As a negative control, CD8+ T cell-depleted spleen cells from PBS-immunized and c-P-treated mice were stimulated with CII (PBS/c-P; open bar). [3H]Thymidine incorporation for the final 7 h was counted. Data are shown as the mean ± SE. b, The titer of anti-CII IgG, IgG1, or IgG2a in sera from sJag1-P-treated (filled bars) or c-P-treated (open bars) mice 10 days after the second CII immunization was evaluated by ELISA. Results are shown as mean ± SE. c, Isolated CD4+ T cells from c-P-treated (open bars) or sJag1-P-treated (filled bars) mice were stimulated with CII (30 μg/ml) in the presence of irradiated spleen cells for 3 days. The IFN-γ, IL-17, and IL-10 levels in the culture supernatants (1 × 106 cells) were measured by ELISA. The value of each cytokine from unstimulated CD4+ T cells from CII immunized mice was below detection limits (data not shown). All results are representative of at least three experiments. Data are averages ± SE from three independent experiments. d, Frequency of CD4+Foxp3+ cells in lymph nodes of PBS and c-P-treated (PBS/c-P), CII and c-P-treated (CII/c-P), or CII and sJag1-P-treated (CII/sJag1-P) mice 7 days after the second CII immunization was evaluated by flow cytometry. The number indicates the percentage of CD25+ cells in CD4+ cells or Foxp3+ cells in CD4+CD25+ cells. We next tested whether sJag1-P treatment affects CII Ab production to evaluate the contribution of CD4+ T cells in sJag1-mediated CIA suppression. The titer of anti-CII specific total IgG, IgG1, and IgG2a in the serum of sJag1-P treated mice was comparable to that of c-P treated mice (Fig. 3⇑b), suggesting that sJag1-P treatment has little inhibitory effect on CD4+ T cells in terms of helper functions against B cells. We next tested cytokine production from CD4+ T cells. The production of IFN-γ, IL-10, and IL-17 was measured in CD4+ T cells 7 days after the second CII immunization of mice. The production of IFN-γ, IL-10, and IL-17 from CD4+ T cells from sJag1-P-treated mice was comparable to that from c-P treated mice (Fig. 3⇑c). Recent evidence has demonstrated that naturally occurring regulatory T cells or Ag stimulation-driven regulatory T cells have important roles in the suppression of autoimmune responses (23, 24). Therefore, we investigated whether sJag1-P treatment preferentially activates CD4+Foxp3+ regulatory T cells. We examined the percentage of CD4+Foxp3+ regulatory T cells 4 days after the second injection of sJag1-P or c-P (Fig. 3⇑d), but no significant difference in percentage or total cell number of CD4+Foxp3+ regulatory T cells between the two groups was observed (Fig. 3⇑d). 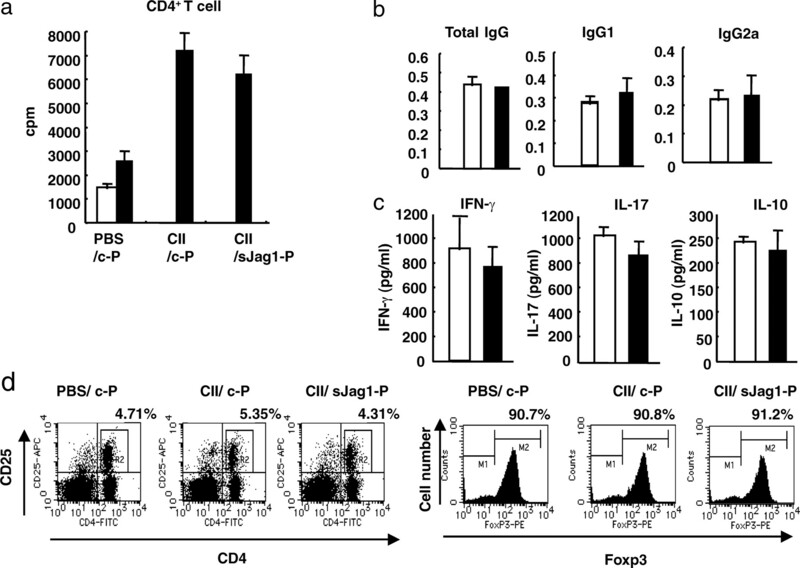 Taken together, these results suggest that the effect of sJag1-P in CIA is independent of either the inhibition of CD4+ T cells or the specific activation of Foxp3+- or IL-10-producing regulatory T cells. CD8+ T cells are also involved in CIA induction (16). Because crucial epitopes of CII for CD8+ T cells have not been identified, it is difficult to analyze CD8+ T cell responses against CII by an in vitro T cell stimulation assay. Indeed, we could not detect CD8+ T cell proliferation against CII by coculturing CD8+ T cells from CII-immunized mice with irradiated spleen cells and CII protein (data not shown). To evaluate whether sJag1-P was able to suppress CD8+ T cell responses, we coimmunized mice with two plasmids encoding Jagged1 and OVA and monitored the number of OVA-specific CD8+ T cells and granzyme B expression in such cells. Vaccination of Jagged1 inhibited the proliferation of OVA-specific CD8+ T cells (Fig. 4⇓a) and also inhibited the expression of granzyme B in CD8+ T cells (Fig. 4⇓a). These results indicate that Jag1 is able to inhibit the activation and functional differentiation of CD8+ T cells. Jagged1 inhibits CD8+ T cell activation and functional differentiation. a, OVA-specific T cells (OVA/MHC) or granzyme B-producing CD8+ T cells (Granzyme B) 5 days after the third injection of C57BL/6 mice with pcDNA3.1 and PBS (control/PBS), pcDNA3.1 encoding OVA (OVA/cDNA), or pcDNA3.1 encoding OVA and Jagged1 (OVA/Jag1) were evaluated by flow cytometry. The number indicates the percentage of OVA-specific T cells in total CD8+ cells, or granzyme B+ cells in CD8+ cells. Five to seven mice per group were used for each experiment, and these results are representative of three independent experiments. b, Purified CD8+ T cells from C57BL/6 mice were labeled with CFSE. Such cells (1 × 107) were stimulated with DCEK cells (1 × 106) transduced with either a control vector (DCEK-mock) or Jagged1 (DCEK-Jagged1) for 3 days. As a negative control, cells were not stimulated with DCEK (No DCEK). CFSE intensity on CD8+ T cells was analyzed by flow cytometry. The number indicates the percentage of CFSElow cells in CD8+ T cells. Results are representative of four independent experiments. We next tested whether overstimulation of CD8+ T cells by Jagged1 affects T cell proliferation in vitro. We stimulated purified CD8+ T cells from BALB/c mice with DCEK cells transduced with control vector or Jagged1. Because DCEK cells express Kk and Dk molecules, BALB/c-derived CD8+ T cells should exhibit an allo-MHC specific response. CD8+ T cells from BALB/c mice were labeled by CFSE and cocultured with DCEK cells for 3 days (Fig. 4⇑b). CD8+ T cells from BALB/c mice proliferated against DCEK cells, and Jagged1 overexpression did not affect proliferation or IFN-γ secretion (data not shown). Taken together, these data suggest that Jagged1 has no direct inhibitory effect on CD8+ T cell activation in vitro. To evaluate the effect of sJag1-P on the CD8+ T cell response during CIA, we depleted CD4+ or CD8+ T cells in CII-immunized mice that were treated with sJag1-P (Fig. 5⇓). Such an approach allows us to evaluate whether CD8+ T cells actually contribute to CIA suppression by sJag1-P. The depletion of CD8+ T cells alone suppressed CIA induction (Fig. 5⇓a). Treatment of CII-immunized DBA/1J mice depleted of CD8+ T cells with sJag1-P did not further suppress clinical scores of CIA (Fig. 5⇓a). Conversely, depletion of CD4+ T cells also suppressed CIA induction, whereas treatment with sJag1-P further suppressed CIA (Fig. 5⇓b). These data strongly suggest that CD8+ T cell activation is suppressed by sJag1-P, which is responsible for CIA suppression by sJag1. sJag1 suppresses CD8+ T cell activation. The anti-CD8 (αCD8) mAb (filled symbols in a) and anti-CD4 (αCD4) mAb (filled symbols in b) or control rat IgG (open symbols in both a and b) was injected into DBA/1J mice every other day starting on the day of the second CII immunization. sJag1-P (circles) or c-P (pcDNA; diamonds) was injected into the mice according to the same protocol for treating CIA. Clinical scores of each mouse were monitored. Five to seven mice per group were used for each experiment and these results are representative of three independent experiments. An asterisk (∗) indicates statistically significant differences (p < 0.05). To examine the physiological roles of Jagged1 during CIA induction, we injected a blocking Ab against Jagged1 in the CIA model. We found a significant increase in the mean clinical score in mice treated with anti-Jagged1 mAb (Fig. 6⇓). Overall disease incidence was similar in all groups (100%) (data not shown). Treatment of anti-Jagged1 mAb exacerbated CIA. The anti-CD8 mAb (♦), anti-Jagged1 mAb (•), both anti-CD8 and anti-Jagged1 mAbs (○) or control rat IgG (⋄) were injected into DBA/1J mice every other day starting on the day of the second CII immunization. Clinical scores of each mouse were monitored. Five to seven mice per group were used for each experiment and these results are representative of three independent experiments. An asterisk (∗) indicates statistically significant differences between control rat IgG and anti-Jagged1 treated groups (p < 0.05). We next examined whether anti-Jagged1 mAb still had an effect on the CIA clinical course in the absence of CD8+ T cells. CD8+ T cell-depleted mice immunized by CII to induce CIA were further treated by anti-Jagged1 mAb (Fig. 6⇑). Treatment of anti-Jagged1 mAb did not exacerbate the clinical course of CIA, indicating the importance of CD8+ T cells to exert the effect of the anti-Jagged1 mAb. Recent studies have provided evidence that Notch signaling controls mature T cell differentiation and activation (2, 5, 13). For the contribution of Notch signaling in T cell-mediated autoimmune disease, two reports have shown that the inhibition of Notch signaling by a γ-secretase inhibitor or an anti-DL1 mAb was able to suppress EAE by modulating CD4+ T cell responses (6, 14). In contrast, treatment with an anti-Jagged1 mAb in mice exacerbates EAE, and Jagged1 has a suppressive ability for CD4+ T cell activation in vitro (14). 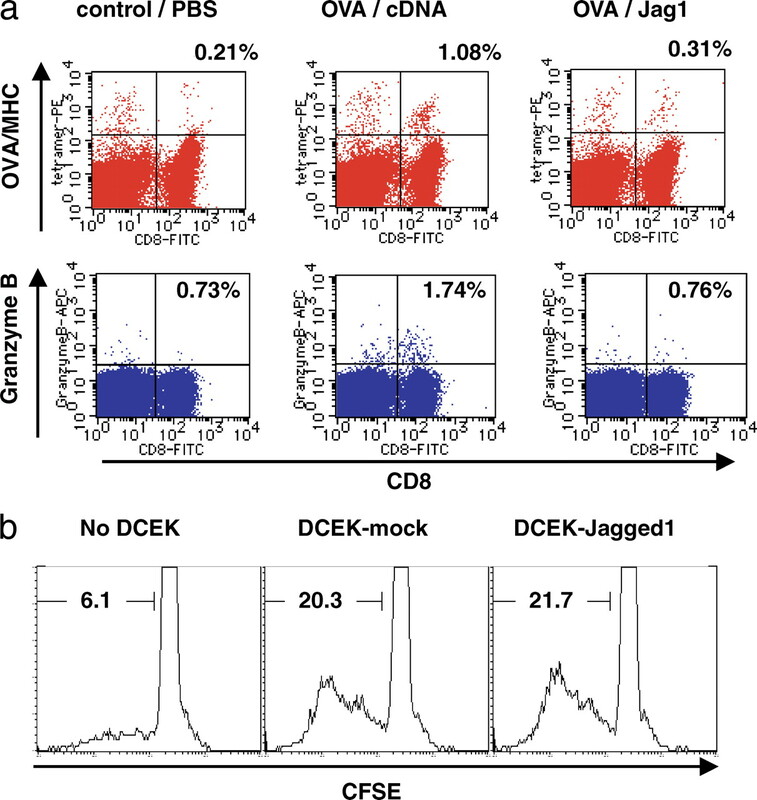 Although these data suggest that Jagged1-mediated Notch signaling suppressed CD4+ T cell responses, it remains unclear whether Jagged1 modulated CD8+ T cell activation. The results presented here demonstrate that overexpression of soluble Jagged1 by injecting sJag1-P is able to suppress CIA induction and progression. The major effect of sJag1-P on the suppression of CIA was to indirectly inhibit CD8+ T cell activation. These data suggest that modulation of Jagged1 could be a new strategy for suppressing CD8+ T cell-mediated autoimmune and infectious disease. CIA is a model for human rheumatoid arthritis and both CD4+ and CD8+ T cells are responsible for the progression of CIA. One report indicated that a perforin deficiency ameliorates the clinical score of CIA, suggesting that the killing activity of CD8+ T cells was responsible for CIA progression (16). Our data showed that injection of sJag1 did not improve the CIA clinical score in the absence of CD8+ T cells. Furthermore, the treatment with anti-Jagged1 mAb exacerbated the CIA clinical score, whereas the same treatment could not affect the CIA clinical score in the absence of CD8+ T cells. Although we have not tested whether the injection of sJag1 decreases the killing activity of CD8+ T cells, coinjection of OVA plasmids with Jag1 in mice disturbed the proliferation and granzyme B production of OVA-specific CD8+ T cells. These data strongly suggest that injection of sJag1 disturbs the proliferation and functional differentiation of CII-specific CD8+ T cells, which would be involved in the amelioration of CIA. Furthermore, the data showing that treatment with anti-Jagged1 Ab exacerbated CIA suggest that Jagged1-Notch interaction has physiological roles in suppressing inflammatory responses induced by CII. Soluble Jagged1 had a suppressive ability on CD8+ T cells but little effect on CD4+ T cells in terms of suppression of CIA. One might argue that soluble Jagged1 competes with DL1 for recognition by Notch receptors, because we have recently found that the stimulation of CD8+ T cells by DL1-Notch2 interaction enhanced CD8+ T cell functional differentiation (13). However, this possibility is unlikely, because the injection of sJag1-P stimulated Notch receptors directly in vitro and further up-regulated the Notch target gene that was induced by endogenous Notch-Notch ligand interaction in vivo. As for the mechanism of suppression of CD8+ T cells by soluble Jagged1, we could not demonstrate a direct effect of Jagged1 on CD8+ T cell activation in vitro. Furthermore, sJag1-P affected CD8+ but not CD4+ T cell proliferation in vivo. Therefore, sJag1 might have selective functions to suppress CD8+ T cells, but not CD4+ T cell activation, by affecting APCs or stromal cells. Of course, it is still possible that higher concentrations of sJag1 may be able to suppress CD4+ T cells by a similar mechanism. In addition, we have examined whether synovial endothelial cells from Jagged1-treated mice have CD8+ T cell-suppressive functions in vitro (data not shown), but we could not observe such an effect, excluding the effect of Jagged1 on synovial endothelial cell functions. Regarding the T cell-suppressive mechanism of Jagged1, we have to consider the contribution of regulatory T cells because several articles reported that Notch signaling controls regulatory T cell functions. For instance, overexpression of Jagged1 in dendritic cells was able to induce peripheral tolerance by supporting the differentiation of regulatory T cells (10). Rutz et al. reported that Jagged1 was able to directly inhibit CD4+ T cell activation (9) and Elyaman et al. reported that Jagged1 is involved in IL-10 production from CD4+ T cells (14). However, our study did not find evidence of an increased number of Foxp3+ regulator T cells or increased IL-10 production from CD4+ T cells, suggesting that these two types of regulatory T cells are not responsible for the effect of soluble Jagged1. Several articles revealed the presence of Foxp3+CD8+ regulatory T cells (25, 26, 27). However, we could not detect increased CD8+Foxp3+ cells the after injection of sJag1-P in CIA mice (data not shown), which does not suggest that CD8+Foxp3+ regulatory T cells contribute to the Jagged1-mediated suppression of CIA. Identification of the cellular target of sJag1, including unidentified regulatory T cells that suppress CD8+ T cells, remains an important issue to be clarified. We demonstrated that inhibition of Jagged1 in CIA caused deterioration of the clinical symptoms and that this effect was canceled by depleting CD8+ T cells, which suggests that Jagged1 has a protective role in CIA progression by affecting CD8+ T cell responses. As for the clinical application of Jagged1, overexpression or inhibition of Jagged1 might be a useful tool for modulating CD8+ T cells in disease. Aberrant overt activation of CD8+ T cells is responsible for a variety of autoimmune diseases, including rheumatoid arthritis, graft-vs-host diseases, and persistent infectious diseases. Therefore, Jagged1 protein administration or Jagged1 gene expression in situ might become a therapeutic strategy to suppress such diseases. In contrast, inhibition of Jagged1 might be useful to strengthen T cell activation, for instance, for tumor-specific CTLs. We thank Dr. T. Kitamura (Tokyo University) for providing a cell line and Kiyoka Yamakawa for secretarial assistance. ↵1 This work was supported by a Grant-in-Aid for Young Scientists (S) from the Japan Society for the Promotion of Science and a Grant-in-Aid for Scientific Research on Priority Areas from The Ministry of Education, Culture, Sports, Science and Technology. ↵2 M.K. and A.I. contributed equally to this study. ↵4 Abbreviations used in this paper: DL, Delta-like; CIA, collagen-induced arthritis; CII, collagen type II; c-P, control plasmid; EAE, experimental autoimmune encephalomyelitis; sJag1-P, soluble Jagged1-encoding plasmid. Radtke, F., A. Wilson, S. J. Mancini, H. R. MacDonald. 2004. Notch regulation of lymphocyte development and function. Nat. Immunol. 5: 247-253. Osborne, B. A., L. M. Minter. 2007. Notch signalling during peripheral T-cell activation and differentiation. Nat. Rev. Immunol. 7: 64-75. Maekawa, Y., S. Tsukumo, S. Chiba, H. Hirai, Y. Hayashi, H. Okada, K. Kishihara, K. Yasutomo. 2003. Delta1-Notch3 interactions bias the functional differentiation of activated CD4+ T cells. Immunity 19: 549-559. Eagar, T. N., Q. Tang, M. Wolfe, Y. He, W. S. Pear, J. A. Bluestone. 2004. Notch 1 signaling regulates peripheral T cell activation. Immunity 20: 407-415. Tsukumo, S., K. Yasutomo. 2004. Notch governing mature T cell differentiation. J. Immunol. 173: 7109-7113. Minter, L. M., D. M. Turley, P. Das, H. M. Shin, I. Joshi, R. G. Lawlor, O. H. Cho, T. Palaga, S. Gottipati, J. C. Telfer, et al 2005. Inhibitors of γ-secretase block in vivo and in vitro T helper type 1 polarization by preventing Notch upregulation of Tbx21. Nat. Immunol. 6: 680-688. Amsen, D., J. M. Blander, G. R. Lee, K. Tanigaki, T. Honjo, R. A. Flavell. 2004. Instruction of distinct CD4 T helper cell fates by different notch ligands on antigen-presenting cells. Cell 117: 515-526. Tanaka, S., J. Tsukada, W. Suzuki, K. Hayashi, K. Tanigaki, M. Tsuji, H. Inoue, T. Honjo, M. Kubo. 2006. The interleukin-4 enhancer CNS-2 is regulated by Notch signals and controls initial expression in NKT cells and memory-type CD4 T cells. Immunity 24: 689-701. Rutz, S., B. Mordmuller, S. Sakano, A. Scheffold. 2005. Notch ligands Delta-like1, Delta-like4 and Jagged1 differentially regulate activation of peripheral T helper cells. Eur. J. Immunol. 35: 2443-2451. Hoyne, G. F., I. Le Roux, M. Corsin-Jimenez, K. Tan, J. Dunne, L. M. Forsyth, M. J. Dallman, M. J. Owen, D. Ish-Horowicz, J. R. Lamb. 2000. Serrate1-induced notch signalling regulates the decision between immunity and tolerance made by peripheral CD4+ T cells. Int. Immunol. 12: 177-185. Wong, K. K., M. J. Carpenter, L. L. Young, S. J. Walker, G. McKenzie, A. J. Rust, G. Ward, L. Packwood, K. Wahl, L. Delriviere, et al 2003. Notch ligation by Delta1 inhibits peripheral immune responses to transplantation antigens by a CD8+ cell-dependent mechanism. J. Clin. Invest. 112: 1741-1750. Palaga, T., L. Miele, T. E. Golde, B. A. Osborne. 2003. TCR-mediated Notch signaling regulates proliferation and IFN-γ production in peripheral T cells. J. Immunol. 171: 3019-3024. Maekawa, Y., Y. Minato, C. Ishifune, T. Kurihara, A. Kitamura, H. Kojima, H. Yagita, M. Sakata-Yanagimoto, T. Saito, I. Taniuchi, et al 2008. Notch2 integrates signaling by the transcription factors RBP-J and CREB1 to promote T cell cytotoxicity. Nat. Immunol. 9: 1140-1147. Elyaman, W., E. M. Bradshaw, Y. Wang, M. Oukka, P. Kivisakk, S. Chiba, H. Yagita, S. J. Khoury. 2007. Jagged1 and Delta1 differentially regulate the outcome of experimental autoimmune encephalomyelitis. J. Immunol. 179: 5990-5998. Feldmann, M., F. M. Brennan, R. N. Maini. 1996. Rheumatoid arthritis. Cell 85: 307-310. Bauer, K., A. Knipper, T. R. Hoang, D. Koczan, H. J. Kreutzer, H. Nizze, E. Mix, H. J. Thiesen, R. Holmdahl, S. M. Ibrahim. 2005. Perforin deficiency attenuates collagen-induced arthritis. Arthritis Res. Ther. 7: R877-R884. Morita, S., T. Kojima, T. Kitamura. 2000. Plat-E: an efficient and stable system for transient packaging of retroviruses. Gene Ther. 7: 1063-1066. Tsukumo, S., K. Hirose, Y. Maekawa, K. Kishihara, K. Yasutomo. 2006. Lunatic fringe controls T cell differentiation through modulating notch signaling. J. Immunol. 177: 8365-8371. Itoh, Y., R. N. Germain. 1997. Single cell analysis reveals regulated hierarchical T cell antigen receptor signaling thresholds and intraclonal heterogeneity for individual cytokine responses of CD4+ T cells. J. Exp. Med. 186: 757-766. Ponio, J. B., C. Wright-Crosnier, M. T. Groyer-Picard, C. Driancourt, I. Beau, M. Hadchouel, M. Meunier-Rotival. 2007. Biological function of mutant forms of JAGGED1 proteins in Alagille syndrome: inhibitory effect on Notch signaling. Hum. Mol. Genet. 16: 2683-2692. Trifonova, R., D. Small, D. Kacer, D. Kovalenko, V. Kolev, A. Mandinova, R. Soldi, L. Liaw, I. Prudovsky, T. Maciag. 2004. The non-transmembrane form of Delta1, but not of Jagged1, induces normal migratory behavior accompanied by fibroblast growth factor receptor 1-dependent transformation. J. Biol. Chem. 279: 13285-13288. Manavalan, J. S., S. Kim-Schulze, L. Scotto, A. J. Naiyer, G. Vlad, P. C. Colombo, C. Marboe, D. Mancini, R. Cortesini, N. Suciu-Foca. 2004. Alloantigen specific CD8+CD28−FOXP3+ T suppressor cells induce ILT3+ILT4+ tolerogenic endothelial cells, inhibiting alloreactivity. Int. Immunol. 16: 1055-1068. Davila, E., Y. M. Kang, Y. W. Park, H. Sawai, X. He, S. Pryshchep, J. J. Goronzy, C. M. Weyand. 2005. Cell-based immunotherapy with suppressor CD8+ T cells in rheumatoid arthritis. J. Immunol. 174: 7292-7301. Singh, R. P., A. La Cava, M. Wong, F. Ebling, B. H. Hahn. 2007. CD8+ T cell-mediated suppression of autoimmunity in a murine lupus model of peptide-induced immune tolerance depends on Foxp3 expression. J. Immunol. 178: 7649-7657.